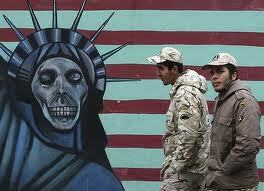 Rare anti-American mural in Tehran. We live in very interesting, perhaps historic, times. 2015, it appears, will be the year when two of Washington's longstanding sanctions regimes will gradually be discontinued. The ones leveled against Cuba and Iran. Both sanctions regimes were introduced not longer after the respective revolutions (1959 and 1979) in each country. Since their respective introductions however the regimes in Havana and Tehran have solidified their holds on power rather than become weakened and the people they rule over disempowered from enacting any meaningful internal political change. Not wholly unlike how the crippling sanctions leveled against the Saddam Hussein regime in Iraq, between 1991 and 2003, actually helped to empower that regime and not only weakened the people over which it ruthlessly ruled, but made them highly dependent on the tyrant in Baghdad. Despite what the Cuban and Iranian populations might think of their rulers the broad and sweeping nature of the sanctions either saw them, like Iraqis in the aforementioned period, rendered dependent on their regime or rally around it, due to that pressure emanating from the outside. Similar to how countries rally around the flag during a particular crisis or war, regardless of what they might otherwise think about their government. This was particularly evident in Iran in the early days of the Islamic Republic when its western province was invaded by Iraq. That war and the external threat Iraq posed proved to be a formative moment for the then nascent Islamic regime as patriotic Iranians sought to defend their land despite whatever other feelings they might have about who is in power in Tehran. Which historically was similar to how Soviets of all stripes fought under the tyrannical Joseph Stalin during the Second World War against invading Nazi Germany. This also explains how, in both cases, the respective Cuban and Iranian diaspora haven't been able to enact regime change from the outside. Cuban opponents of Fidel Castro based in Florida were unable to topple his regime from there in the infamous 1961 Bay of Pigs invasion of their island nation in much the same way the Iraq-based Iranian opposition group the Peoples Mujahideen of Iran (MEK) were unable to topple the regime in Iran from the outside in a similarly botched Bay of Pigs-esque attempt in August 1988. Today with the prospect of Washington lifting the over half-century old embargo it has been leveling against Cuba coupled with sanctions relief on Tehran could gradually open up those two societies and perhaps see to gradual political change in them in the long-run. Some tourist agencies have urged people to book trips to Havana over the course of the last few months by implying it will soon fundamentally change and the retrograde time-warp in which Cuba has been stuck for the past half-century, as a direct result of the trade embargo, will itself be a thing of the past – hence those iconic 1950s-era cars which Havana has become famous for in recent decades may become gradually replaced by more modern automobiles and the country will lose some of the character which attracts tourists who want a different but unique travel experience. Of course such changes should be welcomed if it means that greater openness for that island-nation will lessen the poverty which permeates throughout it. Similarly the prospect of McDonalds coming to Iran has been talked about in light of the recent nuclear agreement between the P5+1 countries and Tehran and the prospects of economic sanctions being eased and, in the long-term, possibly done away with altogether. Not unlike how the comprehensive nuclear talks between the Soviet Union and the United States in the mid to late 1980s led to the opening of a massive McDonalds in Moscow questions have been raised about the possibility of such a fast-food joint opening in Tehran. An urban center many westerners believe to be an irrevocable hotbed of anti-American and anti-western sentiment. Khamenei's aversion to a sudden change is not unlike how many in the west fear the potential consequences of a botched Iran deal and an overly rapid lifting of the sanctions. However whereby the bringing about of political change in Cuba and Iran is concerned western policy over the last few decades has done little to influence change in those capitals or to alleviate the suffering and repression of their respective populations. This indicates that it may well be time to change these longstanding policies which, more likely than not, have done a lot more harm than good. This 'approaches' of a 'dialogue' stem from desires to undermine grip of current authorities on their societes......with a possibility of regime changes, than to relieve economical condition. Paul, I reread your post, accepted your criticism and deleted my comment. Please accept my apology. Economic sanctions are probably one of the most over-rated and useless tools in international diplomacy , especially when dealing with unsavory regimes . The history of sanctions show that they more often than not hurt the very people we are trying to help and strengthen the hands of the threat governments we are trying to contain .Sanctions against governments or countries they represent usually have a very different and unwelcome outcome compared with sanctions used against individuals or specific organizations . In case of Iran , western sanctions have only enabled the Iranian ruling clerics to blame their inept and disastrous mismanagement of Iranian economy on the outsiders .And sanctions have not helped with swaying the average Iranians public opinion and it only adds to the air of mistrust . Dealing with hostile regimes such as Iran , require use of more thoughtful tools than often ineffective economic sanctions .